Notes: Pilsbury Castle was a Norman castle in Derbyshire near the present-day village of Pilsbury, overlooking the River Dove. The castle itself includes a motte and two bailey enclosures, approximately 40 metres (130 ft) and 45 metres (148 ft) across respectively. It had timber defences, ditches and additional flanking earthworks. The castle appears to have been abandoned in subsequent years, and it may be that it was destroyed after William de Ferrers' part in the Revolt of 1173–74, or it might have become abandoned when the land passed to the Duchy of Lancaster after the sixth Earl was dispossessed. 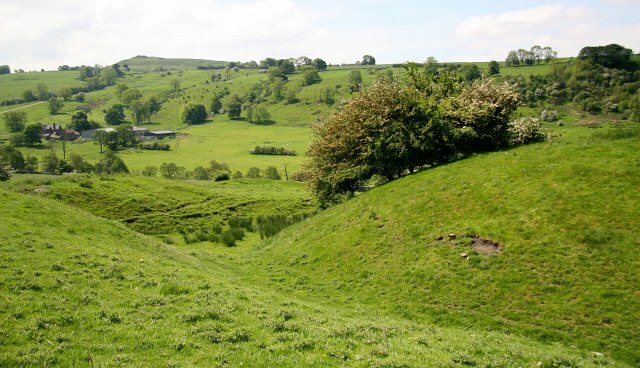 Alternatively, it may simply have become redundant as nearby Hartington grew in importance and the village of Pilsbury became increasingly depopulated. By the 20th century there was little to see except for a mound on a limestone outcrop and the remains of various earthworks. At the beginning of the present century, however, archaeological surveys revealed the foundations of the castle. The site is a Scheduled Ancient Monument.